Do you want to have as much impact as possible with each webinar you deliver? If so, the following will help you regardless of if the webinar is live or automated. If you are offering a webinar, either live or automated, the interaction the attendee experiences is key. In order to develop rapport with you and create that connection, the attendee has to feel they are interacting with you. The following pieces of script are what I use on every webinar I give. Put them to work and benefit. Scripts Environment: These can be used on live or automated webinars, with a question box or with a chat box. Choose one of the following or model one of these. Say this script in the first 10 minutes of your webinar. Script #2: “Assistant Name (whatever your assistant is named) is getting all your questions and (he) she will be organizing them and bringing them into me. I will be focused on the presentation. Submit them now and I will answer then when I turn my attention to your questions, during the Q and A segment. If by chance she misses your question or we don’t have time to answer it, I will personally get you an answer via email after the webinar.” Then during the closing I would reiterate the point you made near the beginning. Here is essentially what I say below. Choose one of the following or model one of these. 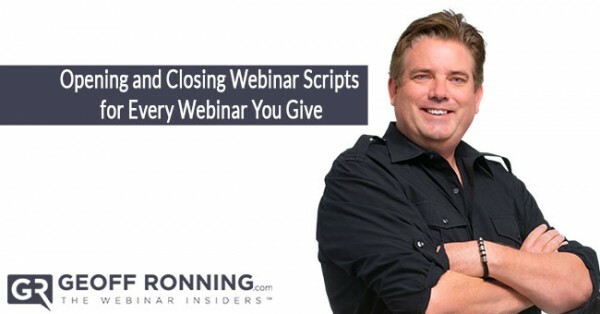 Say this script in the final 10 minutes of your webinar. If you don’t wish to answer questions with post webinar follow up, you can periodically review the questions you are getting that are not answered on your automated webinar. Then simple rerecord the webinar Q and A incorporating the most popular questions that were not answered in the previous webinar. Using the above on your webinars will allow your interaction to flourish and for you to build your value and expertise to your attendees.